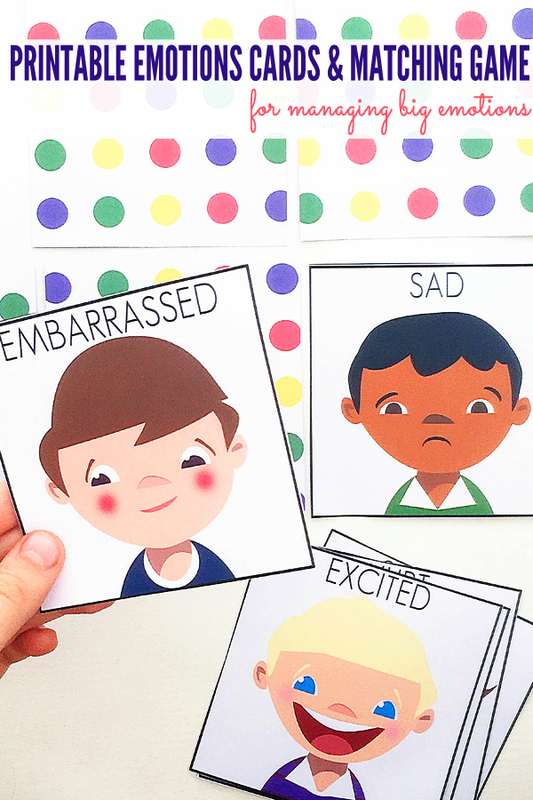 There are so many ways to use a set of emotions cards with children, at home and school. These activities are particularly valuable for helping children to learn to recognise and regulate their own feelings and emotions, as well as learning to recognise and empathise with others struggling with emotions. Today I am sharing a free set of 10 printable emotions cards and I have included eight game suggestions you can play with them. 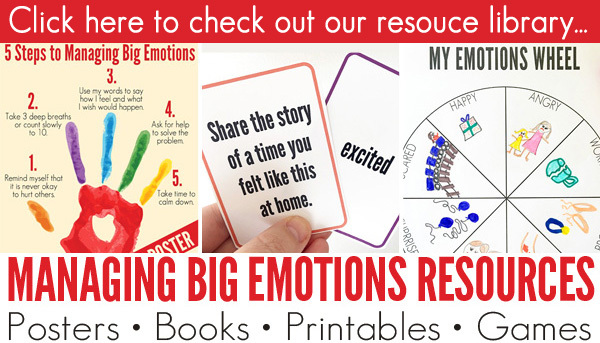 RELATED: Check out the other resources in our Big Emotions Resource Library. Place a set of cards face down on a stack. Turn over the top card. Have your child name the emotion and make a face to match. Spread out a set of cards face up. Take turns to choose a card but don’t tell the other players which you have chosen. Make a face and see if the other players can guess which card you chose. Spread out a set of cards face up. Take turns to choose a card but don’t tell the other players which you have chosen. Tell a short story about a time you felt like that and see if the other players can guess which card you chose. Print two sets of the cards (complete with the backing pattern on the reverse side) to make your own Concentration style matching game. To play, spread out all cards face down. Take turns turning over two cards at a time. If you find a match, you keep that pair of cards. Lay out 3-4 cards. Using a small figurine, tell a short story about the toy. For example – “Peppa’s balloon popped.” Ask your child to put the figurine on the card that shows how Peppa would feel if this happened. Sort a set of cards into positive and negative emotions. Discuss why each emotion is in the nominated group. Choose an negative emotion and talk about ways to speak to and support someone who we can see feels this way. Practice saying these words by role playing being a friend who supports the emotions of others. Print multiple copies of the cards (complete with the backing pattern on the reverse side) to make your own Snap game card pack – you’ll need at least four sets. Shuffle the cards for a game of Snap. 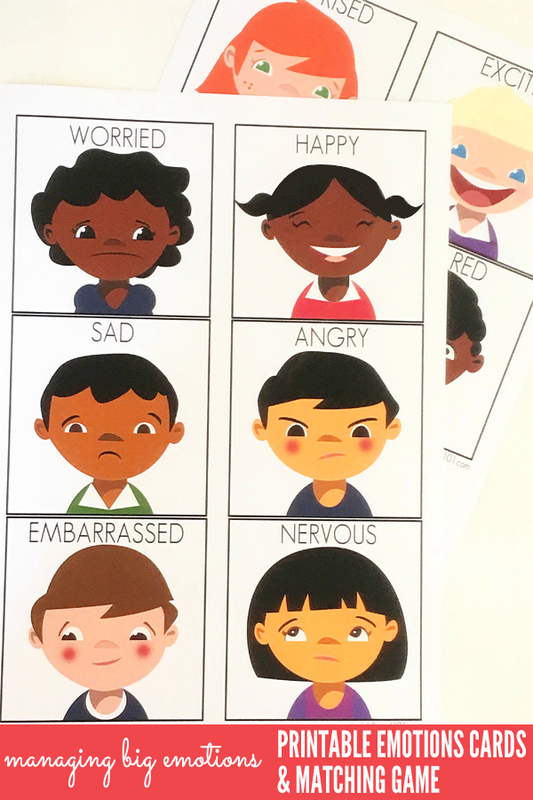 Download the Emotions Cards PDF here: Feelings and Emotions Picture Cards. The PDF includes 10 emotions cards and a backing sheet to be printed on the back of the cards. Print the cards onto matte photo paper or lightweight cardstock. Re-insert the card sheets into the printer and print the backing paper on to the reverse side of these pages. Cut out the cards and laminate for durability. For more Big Emotions Resources, click here. Wow thanks for this! My boy has just been diagnosed with autism so this will be really useful. Wow! This is a valuable resource and will be helpful for many. Pinning this one. Hello Emily, How is this information helping you? I'm anxious to hear your story and ideas. As a teacher, I'm always eager to gain as much information as possible - to help my students reach their fullest potential! These are great! I love the high quality and diverse pictures. I'd love to have even more emotions cards. Frustrated, disappointed, calm, silly, and uncomfortable would be helpful for my classroom. I'm sure I could come up with more as well. Are there any plans to make more?